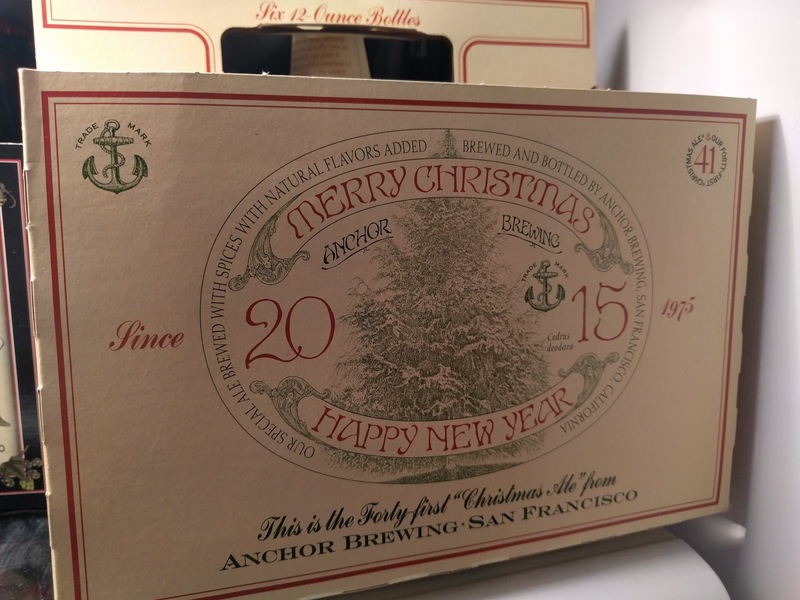 I snapped this photo of the six-pack holder for this year's Christmas Ale from Anchor Brewing the folks who make Anchor Steam. For 41 years, they've been making an annual Christmas Ale and packaging it up with a unique mix and a unique label featuring a different tree. I posted about the 2010 Ale here on the blog, but my brother-in-laws pick up the beer EVERY YEAR in both six packs but also - on occasion - one of those huge magnum bottles. They keep one or two from each year and don't drink them so they can plan a 'vertical' session where they pass out little tasting portions of like five years of the beer to a group to note the differences from year-to-year. If you look at that 2010 post, you'll note that the tree was a Ginko. (Here's a really well done catalog of all the trees they've used over the 41 years.) I think one of Nat's brothers has a poster featuring all the labels. Like I said...they're REALLY into this stuff - and for good reason. Based on that 2010 post, it seems that they've been drinking and documenting the Anchor Christmas Ale since at least 2007 - meaning that this 2015 version is (at least) their 9th year participating out of the 41. But, back to the tree. This year's tree is a Deodar Cedar (Cedrus deodara) - which according to the post on Anchor's site is better known as the California Christmas Tree. The annual search for the perfect tree for our Christmas Ale label usually takes us far afield. This one began and ended with the search for a parking space near the Brewery! Getting out of the car, we couldn't help but notice the way the late-afternoon sun danced amid the branches of two lovely Deodars just half a block from Anchor's front door. Our longtime label artist Jim Stitt—who has been drawing trees for us since 1975—loved "our" Deodars and, like us, was amused that they were about as local as local gets! His charming illustration evokes the radiant beauty of our arboreal neighbors as well as the spirit of the season. Cheers from the Anchor brewers! They made a cute video about this year's Ale, too.